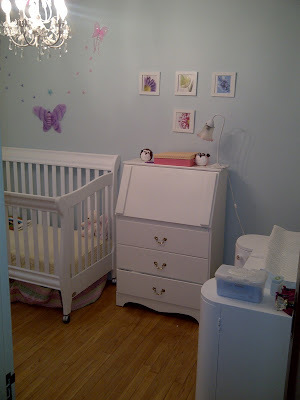 I finally got around to doing something with Norah's room today. Its been in shambles since we moved in. I had thrown some butterflies on the walls in random places to hide nail holes but hadn't put much thought into it at all. Over the past month I had found a variety of things that we had that I wanted to hang in her room and today I finally did it. 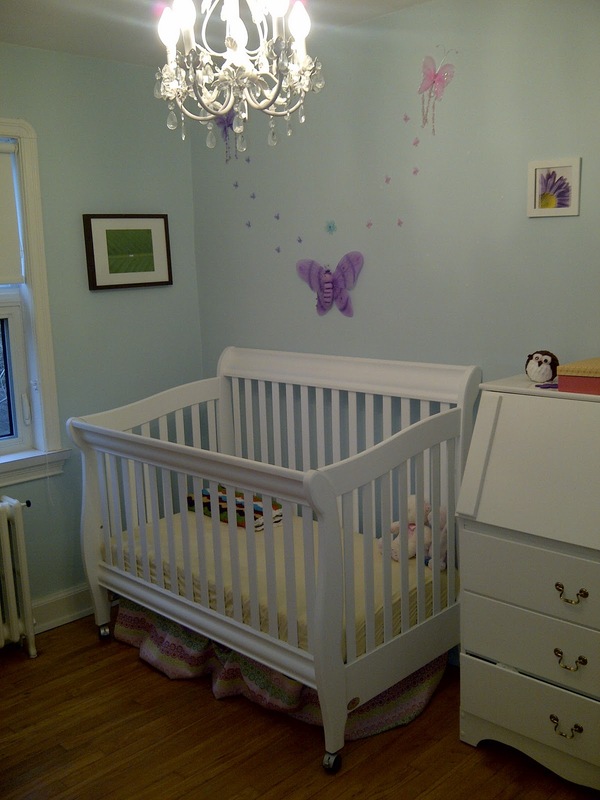 To recap, Norah's room was already painted blue when we moved in and we decided to leave it blue. 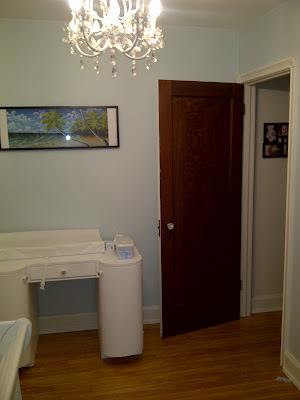 Ultimately that room will not always be her room someday down the line she will be moved to the spare room and that room will be for baby #2 (NO I AM NOT PREGNANT I'm just talking down the line in 2 + years... hahahahaa) So we opted to keep it blue. My mom had thrown a shower for a friend and used butterflies as the theme. Since she still had a bunch left over I stole them off of her and hung them in Norah's room along with a bunch of tropical/flower pictures. 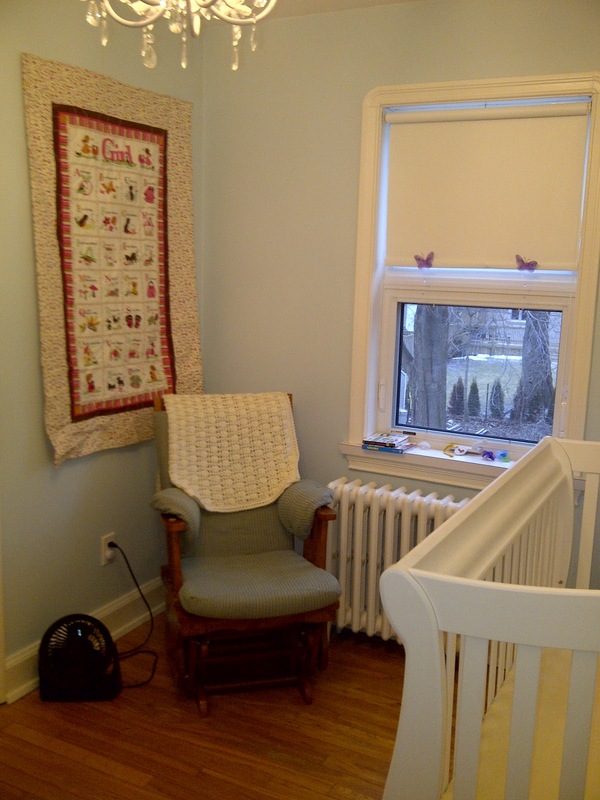 Here is Norah's room now. I would like to note it is no where close to as cool as her old room in the other house BUT I think she likes it anyway. This is the view from the door. 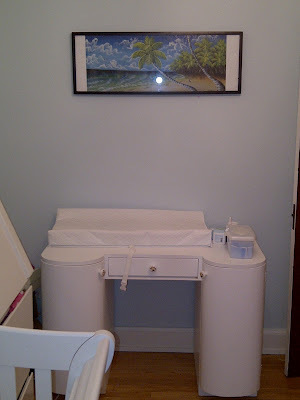 Her change table is on the right side (see what I did to it here). In her desk/dresser we still have all of her diapers and some clothes. 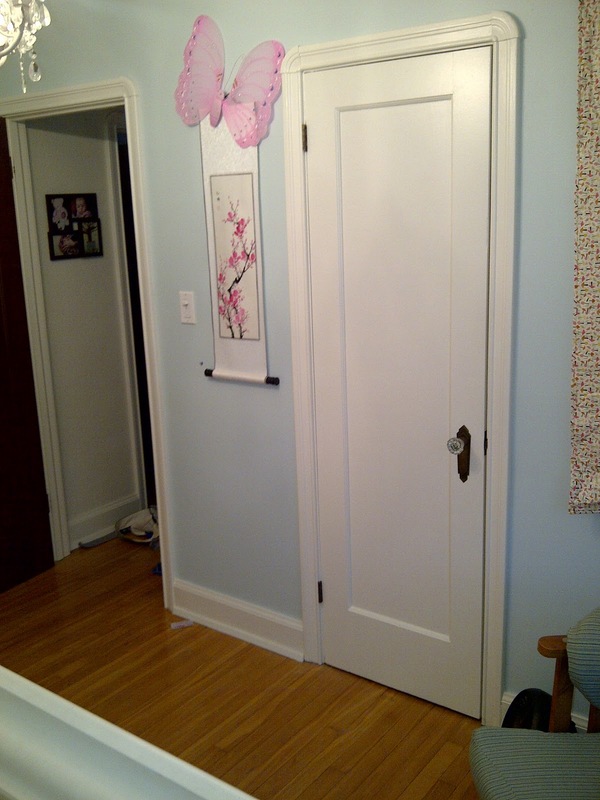 SHE NOW HAS A CLOSET so we have so much more room for clothes its fantastic!!! 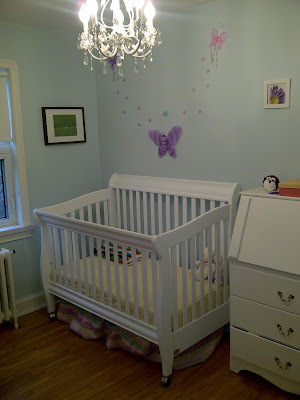 Above her crib I hung butterflies using 3M double sided sticky tape. The picture to the left is one my brother and sister-in-law took when in Honduras and had framed for Norah. Its a picture of butterfly eggs... very appropriate for the room!! Yes I am aware that I need to fix the crib skirt... I need to make a new one but I'll get to that soon enough! Above the change table is a tropical beach picture we picked up in the Dominican. Ryan and I love the picture, I just temporarily mounted it in an ikea frame we had lying around. Eventually I would like to wrap it since it is actually a canvas. But for now it looks just fine. The rocking chair is still being used (for those impromptu nights when Norah wakes up screaming!!) Above it I hung a quilt my sister-in-law made for Norah. I LOVE IT!!! 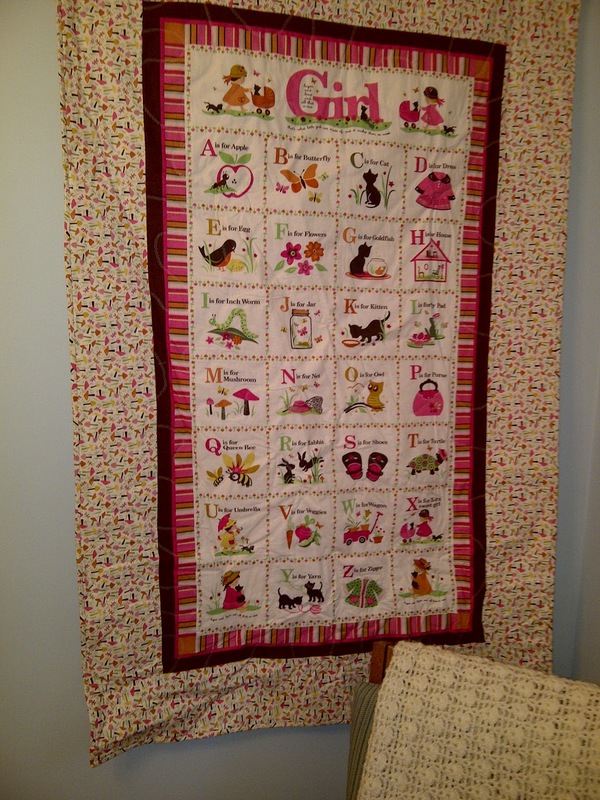 It is the alphabet for girls. My favourite is S for Shoes!!! haahaaa!! Next to the rocking chair is the closet (which I have to do a little more organizing before showing pictures... lets just say there are a fair amount of boxes piled in there). The scoll that is hanging next to the closet was a gift from a friend of mine who brought it back from China. It is cherry blossoms and it fits in perfectly with the room. I even hung an extra butterfly above it to tie it in even more. My favourite part of the entire room is the super adorable white chandelier that came with the house!!! 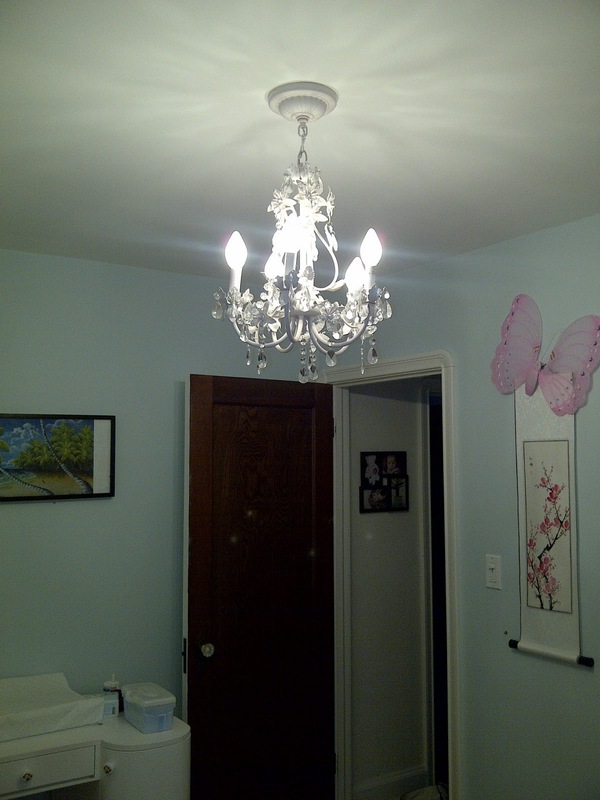 Every little girl needs a chandelier!! !